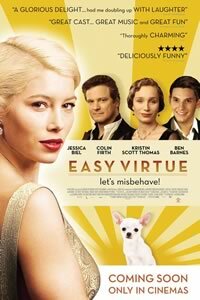 Easy Virtue, based on the play by Noel Coward, is the epitome of British wit. Larita (Jessica Biel) is an American Jazz Age race-car driver. After impulsively tying the knot in Monte Carlo with young Englishman John Whittaker (Ben Barnes), she travels to England to meet her groom’s privileged and batty family. Naturally, they hate her.